Discover the relics of old Ireland on a port call to Dun Laoghaire, located only 15 minutes from Dublin. In Dublin, visit Trinity College and St. Patrick's Cathedral. 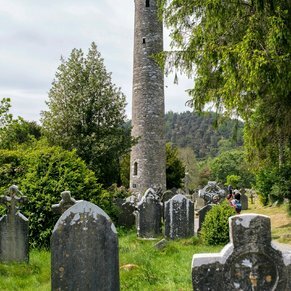 Tour the emerald countryside of Portmamock, and visit nearby Malahide Castle, or see the magnificent Powerscourt Estate in County Wicklow. 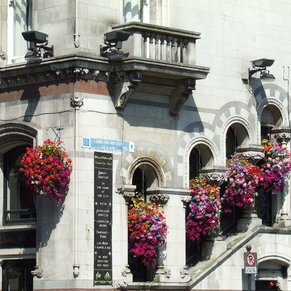 Save time, too, for Dublin's colorful pubs, or a visit to the world-renowned Guinness brewery. We got into port early and had booked a car through our hotel, which was much cheaper than the cruiseline price. We stayed 2 days in Dublin and would loved to have stayed longer. We did a tour in the James Joyce House where the author wrote Ulysses. Then started walking around the city. Found a great fish and chip shop called Beshoff which has been there for 104 years. Really great place, ate there both days. 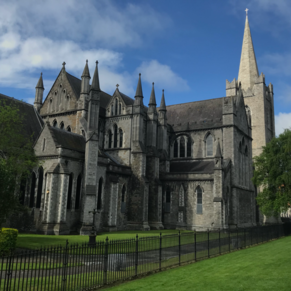 Walked almost 11 miles around Dublin finding beautiful churches, graveyards, a beautiful park called St Stephen's Green and great places to shop. My husband bought 2 tweed jackets and a vest at a place called Kevin & Howlin. Wonderful staff who were SO helpful. Loads of tweeds to choose from. They have ready made and also you can design your own. Great prices and they ship to the US. Another great store is Kilkenny. Really beautiful range of items. Finally found the Celtic cross I was looking for here. The next day we had booked an early tour to see the Book of Kells with a tour company called Letzgo City Tours. They book smaller group tours. We had an amazing tour guide Neil who was amazing, Loads of great stories and information. It was a walking tour which also included the Dublin Castle. We had about 10 people the day we went. Learned a lot and had a wonderful time. If we had stayed another day, we would have booked with them to go to St Patrick's Cathedral. Great incentive to go back to Dublin. I always love to visit Dublin. Had a very enjoyable trip round the city despite the rain! There is plenty to see and even though it was Sunday and a catholic country after about 10 am everything was open. So there was as much to see and do as on any other day. Shuttle bus had a bit of problem getting to city, but that was because of a changed road closure at short notice. We went early on our own to enjoy this city. It was a nice place to see. 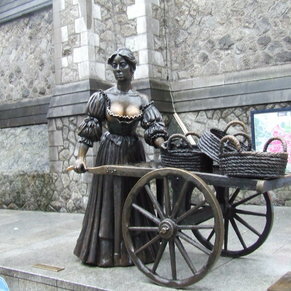 3 of 24 shore excursions in Dublin, Ireland. There are currently 5 discussions about Dublin, Ireland.